The IPL G Cabrio Concept goes from 0 to 100kph in less than 6 seconds. 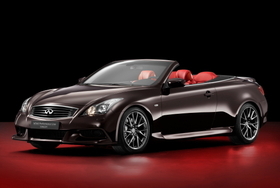 Reaction to the IPL G Cabrio Concept at the Paris auto show will determine whether Infiniti will challenge Audi's S, BMW's M and Mercedes-Benz's AMG models in Europe. Infiniti unveiled the first production model in its IPL (short for Infiniti Performance Line) range, the IPL G Coupe, in the United States in August. U.S. sales start in December. The IPL G Cabrio Concept has a 3.7-liter V-6 engine with 338 hp, an increase of 18 hp compared with the standard G Cabrio. The added power, which comes from a high-flow dual exhaust system, helps the car reach a top speed of 270kph and go from 0 to 100kph in less than 6 seconds. The concept's maximum torque is increased to 374 newton meters from 360 newton meters and its sports suspension includes recalibrated dampers and springs that are 10 percent stiffer than those on the regular G Cabrio. Exterior features on the sleek, powerful-looking concept include sculptured side sill extensions and bigger wheels to accentuate its stance.